When I plug in my Apple iPhone 4s into my Dell Windows 7 laptop, it automatically imports all the photos and videos into Windows Live Photo Gallery. It’s driving me crazy! I don’t want to use this particular program for managing my photos! How can I change it or, better, have Win7 simply ask me what to do when I hook up my iPhone? While the experience of using the iPhone with a Mac OS X system is remarkably smooth, tightly integrated through the central switching station of iTunes, on the PC it really is a different and less pleasant experience. Where do your contacts save on the PC? Where are your photos? What happens to videos? We can’t solve all the problems here in this one post, but when you ask about photo management for your iPhone pictures on your Windows 7 computer, well, you’re opening up the proverbial can of worms. 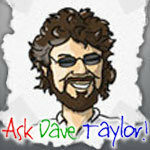 Ask Dave Taylor Apple, ask dave taylor, iphone, Windows 7. permalink.